If I open TeeChart Editor while Visual Studio is debugging my application (to see some settings only, not to change them of course) and the I click "Close" button - my IDE hangs for a while and then crashes. Looks like TeeChart Editor tries to save some settings and fails. But why does it do this - I did not change any settings? That is relevant for both Visual Studio 2010 SP1 and Visual Studio 2017. This is expected behavior. The TextRenderingHint property of the Aspect class is independent of the Quality property of the Font class even though the two properties are of the same type (System.Drawing.Text.TextRenderingHint). This was designed to enable each instance of the Font class to use a particular value of System.Drawing.Text.TextRenderingHint over and above the more universal TextRenderingHint property of the Aspect class. [*] If I open TeeChart Editor while Visual Studio is debugging my application (to see some settings only, not to change them of course) and the I click "Close" button - my IDE hangs for a while and then crashes. 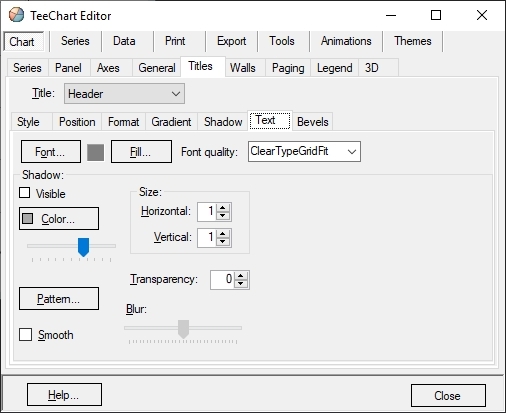 Looks like TeeChart Editor tries to save some settings and fails. But why does it do this - I did not change any settings? Every time the Chart Editor is opened and closed the ITypeDescriptorContext.ComponentChanged event is called which will attempt to write out the Chart properties to the InitializeComponent() section of the Windows Form. This is standard behavior for a component with a 'custom' editor. 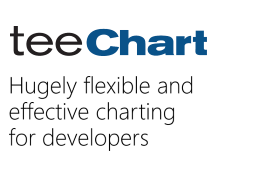 We recommend you use alternative methods to check the values of Chart properties at debug time such as the Console.WriteLine method. 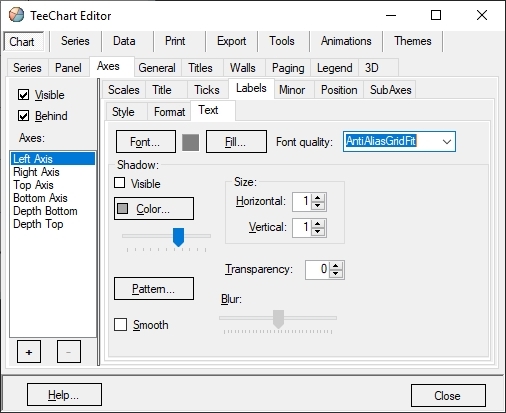 You mean that I can for example set Font Quality for titles separately from Font Quality for left axis labels, right? Than is NOT expected behaviour! AntiAlias for titles that I've set before will be ignored in the next build. Than is NOT expected behaviour! AntiAliasGridFit will be applied for titles as well the next build. So I'm trying to say that TeeChart Editor is working incorrectly now: it always overwriting Aspect.TextRenderingHint property. 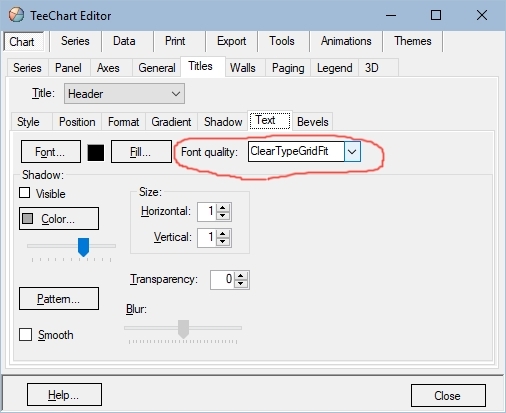 It never sets Font.Quality property as you declared above. Easy way: If tChart1.Aspect was already set somewhere to SomeValue - current value for any Font Quality in TeeChart Editor shouldn't bу dropped to ClearTypeGridFit, it should be SomeValue.